From their very first field test in 1987, GMOs have been the subject of intense debate. What we fight about when we fight about GMOs. 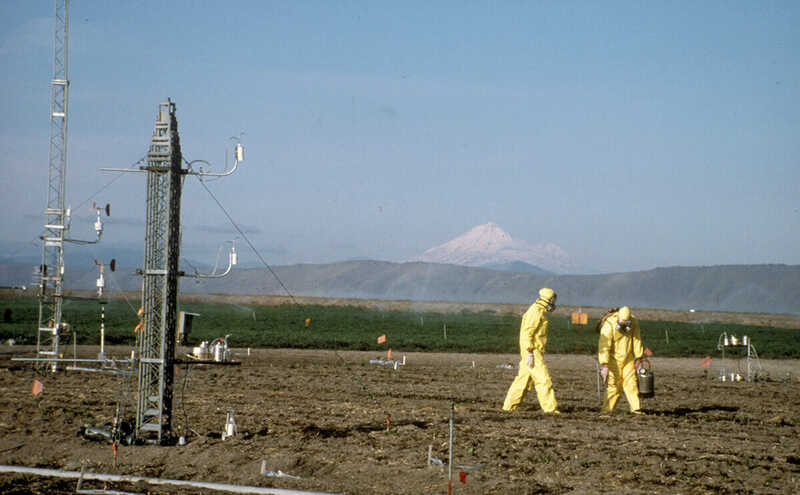 In the spring of 1987 in Tulelake, a tiny California farming town four miles from the Oregon border, a small band of scientists wearing yellow Tyvek suits and respirators paced across a field spraying potato plants from handheld dispensers. Representatives from the Environmental Protection Agency perched on ladders above and checked air monitors to make sure the contents of the dispensers weren’t spreading beyond the field’s boundaries. Dressed in billowy white safety jumpers and peaked caps, the EPA agents looked like apocalyptic bakers. Nearby, journalists eagerly took notes and snapped photos of this eerie scene, which would become national news – this was the world’s first field experiment of a controversial new technology: genetically modified organisms. The organism in the Tulelake test was a modified version of the bacterium Pseudomonas syringae, or ice-minus. 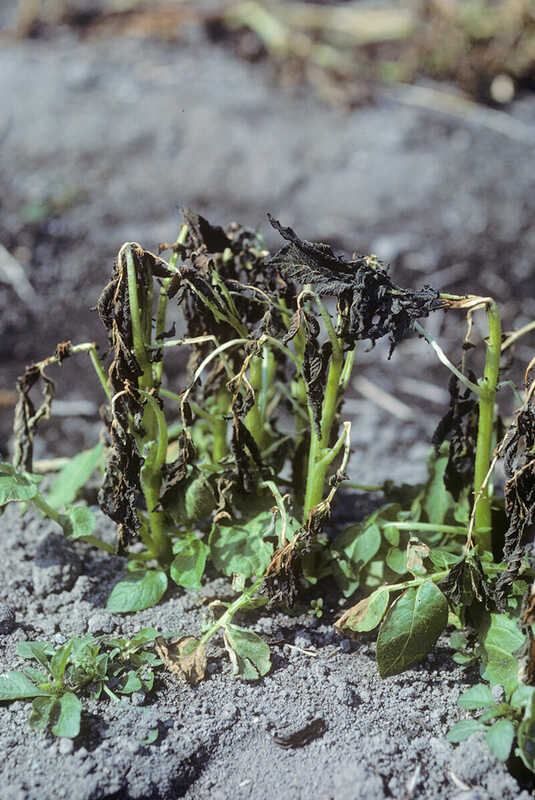 In its natural state, P. syringae is a common pathogen to many plants. In the mid-seventies a doctoral student at the University of Wisconsin named Steven Lindow discovered that the bacteria caused plants to freeze at higher temperatures than normal. A few years later, Lindow moved to the University of California, Berkeley, and he and his new team began to peer inside the bacteria for the gene that promoted frost in plants ”“ something that cost farmers $1.5 billion a year in crop damage. They found and deleted that gene, creating modified bacteria that didn’t encourage frost. If the modified bacteria were released in a field, the reasoning went, they might outcompete native bacteria and keep crops from freezing in a cold snap. By 1982, the scientists were busy planning field tests to see if their genetically engineered bacteria could help crops fight frost. Despite the good intentions and low risks, environmentalists were wary of ice-minus and blocked the field tests through four years of protest and litigation, prompting congressional hearings and more safety tests. The lawsuits were spearheaded by the most prominent genetic-engineering skeptic of the era, the political activist Jeremy Rifkin. Lindow’s experiments were thorough, but no test could rule out all potential problems. Rifkin didn’t see the point in accepting even a sliver of uncertainty. Environmental Protection Agency representatives take an air sample. Courtesy Steven Lindow, the University of California, Berkeley. A plant destroyed by frost. Courtesy Steven Lindow, the University of California, Berkeley. Berkeley researchers plant pieces of potatoes coated in ice-minus bacteria. Courtesy Steven Lindow, the University of California, Berkeley. The argument fit into a common pattern for new technologies, which is a difference of opinion on how to assess risk. The scientific perspective is that if tests say the risk is low, it’s reasonable to proceed. It’s impossible to rule out all possible negative outcomes; to require it would mean halting all scientific and technological progress. Consumer advocates are typically much more leery of any potential risk ”“ though both sides always want to minimize possible dangers. The actions of a small California biotech company called Advanced Genetic Sciences didn’t help the public’s perception of ice-minus. AGS licensed Lindow’s technology under the name Frostban, and according to Hall’s Smithsonian piece, the company tested the product on trees on the roof of its Oakland headquarters without official permission. The EPA slapped AGS with a $13,000 fine, and the environmentalists had a new reason to distrust companies involved in GMOs. Despite the corporate missteps and litigations, the government eventually approved the ice-minus tests, but required strict scrutiny, hence the ghostly moonsuits and air-monitoring towers. 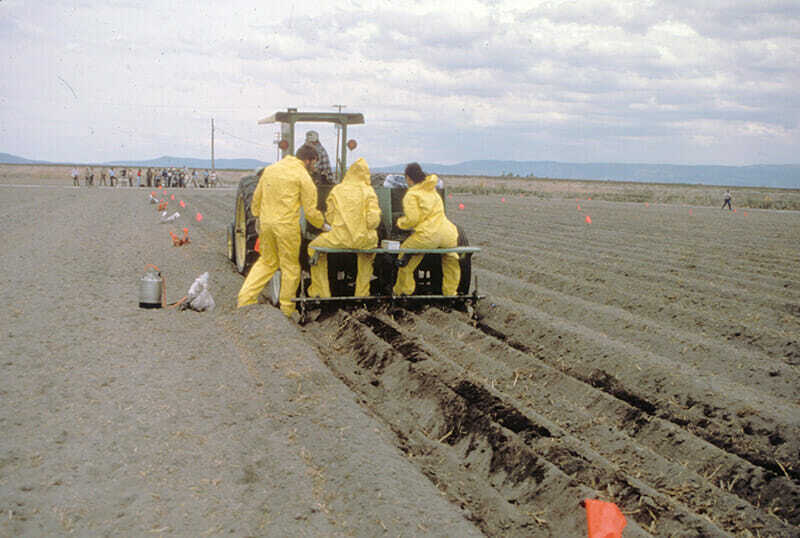 Lindow’s team coated several thousand pieces of potato with the bacteria and then planted them in the Tulelake field. Before he could move to the second stage, which was to spray bacteria on the leaves of the sprouted seedlings, trespassers uprooted around half of the potatoes. The scientists replanted and sat guard by night from a van parked nearby. Vandals slashed the van’s tires, according to Lindow. Further south in Brentwood, a sanctioned test by AGS involving ice-minus and strawberry plants also faced abuse. Ice-minus never went commercial, partly because of regulatory hurdles and partly because there were natural bacteria products that did the same job (although ice-minus worked a little better). But nearly 30 years later the fight over GMOs continues. There’s growing scientific consensus on the technology’s safety, but skepticism has deepened and GMO crops have been ripped out of fields from the United Kingdom to the Philippines. Some scientists and journalists involved in the debate say it has become increasingly polarized, with one extreme asserting that the technology will save the world and the other claiming the opposite. Why have GMOs captured the collective imagination? They aren’t our only high-tech agricultural approach, or anywhere near as pressing a concern as climate change. Still, it’s this specific technology that has struck a nerve. Nathanael Johnson, the food writer at Grist who wrote an in-depth series on GMOs last year, suggests the reaction comes from a heightened concern over where our food comes from, which coincided with the rise of the GMO. Why have GMOs captured the collective imagination? They aren’t our only high-tech agricultural approach, or anywhere near as pressing a concern as climate change. Still, it’s this specific technology that has struck a nerve. Concern continues to grow over our modern globalized and industrialized agricultural system, from the impact of factory farming and monocultures to food safety. There are broader questions, too. Should seeds be patented? Is it good or bad to have multinational corporations own vital swaths of the food supply? Climate change and a skyrocketing global population give these conversations a sense of urgency. GMOs have become a proxy for these legitimate worries, says Keith Kloor, a science journalist who has chronicled the GMO conversations for the past several years on his Discover blog. But it’s difficult to have a nuanced and complicated discussion about our food system, and so GMOs are an easy target for venting frustrations. Add in the Internet and social media, nonexistent in 1987 during the ice-minus debate, and a worrying URL or meme spreads almost instantly. One reason it has been easy to talk about GMOs this way is because they are treated as a monolithic category, says Amy Harmon, a reporter at the New York Times who has written extensively about the technology and its social implications. This is partly because people don’t trust Monsanto, which has cast a shadow on modern GMOs just as AGS’s covert rooftop tests rattled the public’s nerves over ice-minus. In many minds, GMOs equal Monsanto, and Monsanto equals evil. While Monsanto has cornered most of the GMO market with its insect-resistant and herbicide-tolerant crops, each of which has environmental costs and benefits, there is also the virus-resistant papaya that helped save an entire industry in Hawaii and the ongoing work from the University of Florida and other academic institutions that aims to save oranges from the plant disease citrus greening. These projects (not undertaken by Monsanto) are only alike in the technology they use. They differ in that each GMO has its own agricultural merit, as well as its own risk. And, like ice-minus, each goes through a litany of tests to make sure that risk is a small as possible. With the right applications and the right risk assessments, technology isn’t the antithesis of sustainability – it can help build an ecologically based agriculture, too, says Pamela Ronald, a plant geneticist at the University of California, Davis. Ronald was a graduate student at Berkeley during ice-minus, and her research today focuses on genetically engineering rice for disease resistance and flood tolerance. There’s more evidence of this shift. Doug Gurian-Sherman, a senior scientist with the Union of Concerned Scientists – one of the few scientific organizations that takes a skeptical view of GMOs – tells Modern Farmer that his group isn’t actually fundamentally opposed to the technology. He also says that health risks and environmental impacts are not his primary concern, although he’s pushing to minimize them further. Instead, the UCS simply wants better federal regulation to manage potential risks, no matter how small. Perhaps these small movements will give way to a more interesting conversation. Despite differences in opinions on the specifics, the scientists and journalists that Modern Farmer spoke with want to move in the same direction – towards addressing regulatory holes, streamlining the assessment of GMOs and tackling a failing patent system that stymies research. Others wondered whether or not GMOs are even necessary to feed the world. And if the technology is necessary or at least helpful, maybe there should be more of a push towards GMOs as an open-source public good rather than one controlled by corporate interests. Wherever the conversation leads, how will we look back on today’s agricultural debates in 30 years? 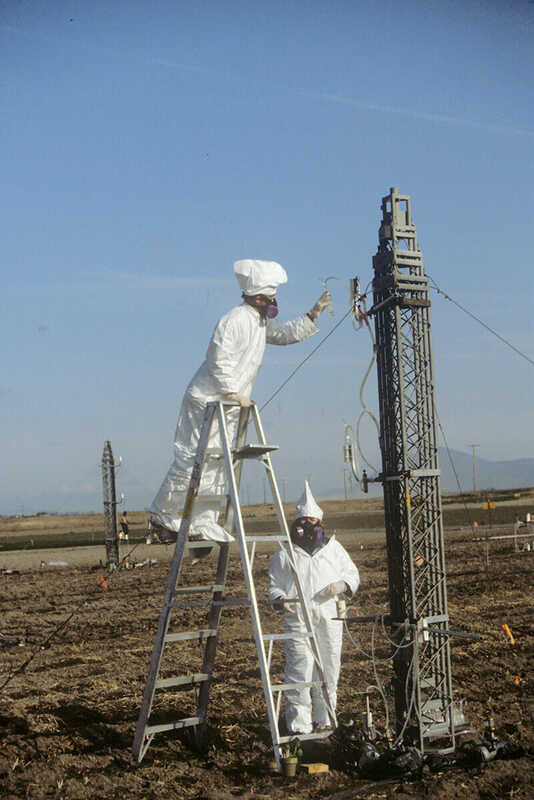 Which of our talking points will still be in rotation and which will be relics like the Tyvek suits and respirators of Tulelake? “I think whenever you confront the introduction of a new technology there’s a natural inclination to proceed very carefully and almost haltingly,” says Hall, the author of the 1987 Smithsonian piece on ice-minus, speaking today.